The world's most powerful central bank is relying on a novelty tune to maintain the hyper-speculative status quo. Back in the Roaring 1920s, a novelty song entitled Yes! We Have No Bananas (1923) was a major hit. The song made fun of a fruit vendor who answered "yes" to every query--even when he didn't have the requested item--for example, bananas. Today, in the Roaring Teens, the Federal Reserve has their own novelty tune:yes, we have no rate hikes. Just like the always-positive fruit vendor in the 1920s who answered "yes" to every question, the Fed answers "yes" every time someone asks if they are indeed going to raise interest rates a smidgen. Despite their automatic affirmative, we have no rate hikes. 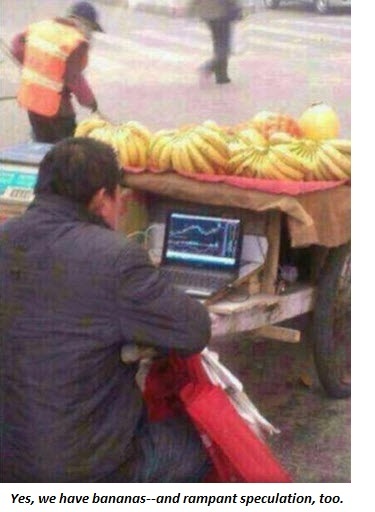 The reason why, oddly enough, goes right back to banana vendors--in this case, banana vendors in China, who are speculating on margin (i.e with borrowed money) in China's casino stock market. The reason why the Fed is wary of raising rates isn't the real-world impact. As I have noted here many times, a quarter-point increase won't torpedo any auto loan or mortgage being issued to qualified buyers. If a buyer can't qualify for a home loan because rates clicked up .25%, they have no business buying a house anyway--they are not qualified by any prudent lending standards. As for subprime auto loans--the firms issuing these loans don't care if rates click up .25%--the subprime market world of high rates and high fees is unaffected by a tiny uptick in rates. Who's affected by a meager .25% uptick? Speculators: every speculator from the banana vendors on the street to hedge funds gambling billions in foreign exchange markets is exposed to massive tidal forces unleashed by higher rates in the U.S. If rates click up even one-quarter of 1%, vast carry trades are no longer profitable and the huge capital flows reverse. Suddenly, U.S. dollars are scarce and everyone has to dump whatever currencies they were gambling with to get USD. This selling crashes demand for emerging-market and periphery currencies while boosting demand for U.S. dollars. the net result is predictable: the U.S. dollar has gained and the emerging-market and periphery currencies have cratered. The net result is absolute carnage in emerging market currencies--and as a knock-on effect, in emerging market stock markets as well. China appeared immune to these forces, but the $1 trillion in USD-denominated debt of Chinese corporations is one domino of several that are teetering as even the suggestion of higher rates in the U.S. is reversing capital flows from risk-on to risk-off--not just in emerging markets, but in China, too. The Fed has lavishly supported speculators on a global scale since 2009. Now it has to sing the absurdist tune yes, we have no rate hikes: yes, the Fed wants to start "normalizing" zero-interest rates, but the moment it does so, trillions of dollars in speculative bets placed in the glory years of quantitative easing (QE) and ZIRP (zero-interest rate policy) go up in smoke, and the mad dash for dollars tramples everything in its path. In the current Theater of the Absurd, the world's most powerful central bank is relying on a novelty tune to maintain the hyper-speculative status quo. It would be humorous if it wasn't so tragic. Thank you, Wayne H. ($50), for your splendidly generous contribution to this site-- I am greatly honored by your support and readership.